Though we are offering this book as an additional resource for your cybersecurity library, the views, thoughts, and opinions expressed in the text belong solely to the author. *Note: Ships to US, Canada and Australia ONLY! Technology now is no longer a tool to ease our existence because, it is central to our very survival. Should technology fail, then society as we have come to know it, will also fail. If we expect industry to be safe, communications to continue, electricity and water to feed into homes and businesses, food to be available, money to be in the bank and to have some semblance of privacy, then technology must be strategically and rigorously protected – because today there are many bad actors in the game. Often though there is only one isolated individual installed in a company who is expected to defend our freedoms and existence: the CISO. This role, and the people behind it, frequently go unrecognized and unsupported despite the fact they are protecting the way not only that we have come to live, but expect to. 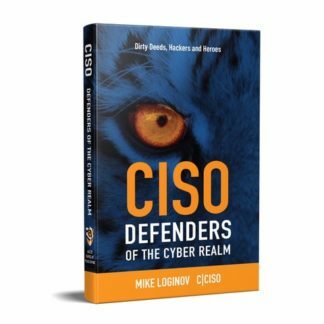 This book opens up the world of the Chief Information Security Officer (CISO) and who they are. It also reveals to the reader the unseen daily dangers that we all face and how, in our current society, we now walk a tightrope between safety and catastrophe. Hackers, Slaughterbots, Blockchain, Artificial Intelligence (A.I. ), Machine Learning (M.L.) and cybersecurity, all matters that should trouble every citizen of the internet age. Mike Loginov is an award-winning Certified Chief Information Security Officer (CISO) and CEO of the Ascot Barclay Cyber Security Group, Founder and President of the International Operational Technology Security Association (IOTSA) He was a founding member of the Coventry University National MBA in Cyber Security and is an advisor on Cranfield Universities MSc in Cybersecurity for Manufacturing and Engineering. A high profile international security executive with hands-on experience at ‘C’ level defending global organizations from cyber attacks.